THE COMPLEX THAT THIS CONDO IS LOCATED IN IS UNDERGOING CONSTRUCTION ON THE FIRST TWO LEVELS. THIS CONDO IS LOCATED ON THE THIRD FLOOR WHERE THERE IS NO CONSTRUCTION, PLEASE INQUIRE FOR HOW TO ACCESS THE UNIT. IN ADDITION, THIS PROPERTY IS AVAILABLE FOR THE SUMMER OF 2019 INQUIRE FOR DETAILS. UNTIL FURTHER NOTICE THE HOT TUB WILL NOT BE AVAILABLE FOR THE WINTER OF 2019. This new condo is located in beautiful Mt. Crested Butte, CO and is across the street from the base area! The unit is situated in the newly constructed Timbers building and features stylish furnishings and all new appliances. This condo is cute, conveniently located, and offered at a great price! The Timbers Retreat offers wood floors, stainless appliances, quartz counter tops, ceramic tile, knotty alder cabinets and chrome fixtures. Its open layout is great for entertaining family and friends. The dining table offers seating for six to enjoy family meals. Step onto the deck, situated off the living area, and enjoy the fresh mountain air! There are two bedrooms, one of which is furnished with a queen bed and the second with a full sized bed. An in suite washer and dryer makes this the perfect getaway for your next visit to Crested Butte! Other amenities for this property include an outdoor, community hot tub & BBQ area, ski & bike tuning station, elevator, and designated ski locker. The building is conveniently located along the free condo shuttle loop for even easier access to the base area. 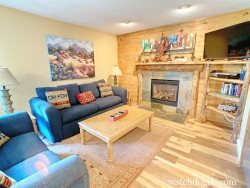 Don’t pass up this property up for your next Crested Butte vacation! "The location is ideal. The unit is clean and comfortable. Despite its compact square footage, this unit is laid out very well and lives large. It is well stocked with kitchen supplies. Comfortable and convenient." Across from the Base Area!